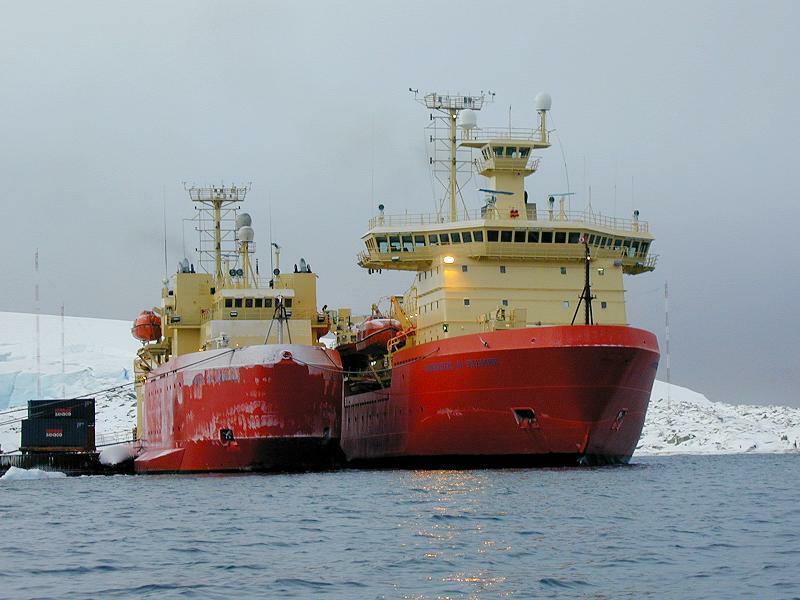 The U. S. National Science Foundation (NSF) Office of Polar Programs (OPP) funds the operation of two Research Vessel Ice Breakers (RVIB) in the Antarctic: the Nathaniel B. Palmer (NBP) and the Laurence M. Gould (LMG). Both ships now have dual frequency shipboard ADCP systems based on RD Instruments narrowband VM-150 and phased array OS-38 profilers, with precision (PPS, or P/Y-code) GPS navigation and with heading corrections provided by GPS attitude sensors. These systems offer the prospect of routine current profile measurements in the top 1000 m along a variety of cruise tracks through otherwise rarely sampled waters of the Southern Ocean. Dr. Teresa Chereskin at Scripps Institution of Oceanography and Dr. Eric Firing at University of Hawaii are funded by the NSF OPP to oversee the operation of these ADCP systems under grants OPP-0338103 and OPP-0337375, respectively. The 38 kHz Ocean Surveyor ADCP (OS38) can reach to 1200 m in good weather in its deep-profiling mode. In bad weather, low scattering conditions, or some speed/heading/sea state conditions that entrain bubbles under the transducer, the range is less. The RDI 150 kHz narrowband instrument (NB150) profiles at higher resolution to as deep as 300 m. Data acquisition for both sonars and the requisite ancillary navigation streams occurs via the UHDAS software, written by Eric Firing and Jules Hummon, University of Hawaii. Data streams logged by UHDAS include roughly one-second gyro heading, GPS heading, pcode position, speed of sound, and single-ping ADCP data. Our Linux computer processes five-minute averaged data on a daily basis, creating a regularly updated, preprocessed and edited dataset. Once a day, it emails us a report with system information, data quality parameters, and a sample of recent data. A vector plot is generated at University of Hawaii/Scripps Institution of Oceanography upon receipt of the email from the NBP/LMG, respectively. Throughout the day, the on-board Linux system updates figures on a shipboard ADCP website. This website is accessible to anyone on the ship's network, and contains links to recently generated figures, the data used to create them, and adcp logging system documentation. Access to the data is also provided through shared disks for Microsoft or Unix machines on the ship's network. Processed data are archived by the NODC JASADCP. As we receive links to the processed cruises available at NODC, we will post them to this website and (eventually) link them to our summary plot pages. Status of the project and more plots of the resulting measurements will be added to this page.